IOS 10 can help you find your parked car. The Bedtime feature offers you a bedtime reminder. Siri can communicate with various apps. NEW YORK: It can remind you where you parked, announce aloud who is calling and even automatically save you some space on your phone by removing music you haven’t listened to in a while. Go grab iOS 10 if you haven’t already done so. Apple’s free mobile operating system is indeed a major update for your iPhone (and iPad), with a gaggle of features, some large, but many small, that can collectively give a nice jolt to your perfectly functioning but aging handset. Of course, iOS 10 is at the very core of the new iPhone 7 and iPhone 7 Plus that first hit stores Friday. I’ve been using the software in beta for a couple of months, and for more than a week now on the latest iPhones. The update is well worth it. 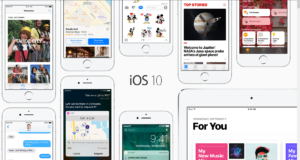 To be sure, some of the features that come with iOS 10 represent more of a big deal than others — and yes, some find Apple playing catch-up to rivals. IOS 10 brings a lot of extra spice to the Messages app, with animated stickers, fireworks and other fanciful effects, built-in image search and a dedicated iMessages App Store. Search is better and so are notifications, and Apple Music is also vastly improved. The Photos app now exploits advanced computer vision to automatically analyze and organize the images in your library — ask Siri, for example, to find the pictures you took at the beach or the ones that have a dog in them. Never mind that Google got a head start on Apple with this sort of thing. Siri itself now gets chummy with third-party app developers, and though still a work in progress as some of those developers continue to update their wares, is freed up to do a lot more. The experience isn’t perfect yet: One time when I asked Siri to book me a ride to a location in New Jersey, it first asked me which app I wanted to use on my phone, Uber, Lyft or local taxis. After selecting Uber, Siri asked me “what type of ride” I wanted: uberPool, uberX, etc.? All good. But when Siri said Uber could get me a ride in two minutes, it had misread my destination and quoted me a much higher fare. I had better luck during other tries. You can also arrange to have Siri send money for you, through such apps as Square Cash or Venmo. This didn’t completely go off without a hitch, either. Siri couldn’t find a friend I wanted to pay inside Venmo, even though the person is among my Venmo friends inside the app. I also ran into trouble with a Square Cash transaction. You’ve long been able to identify incoming callers via Caller ID or by assigning specific ringtones to your contacts. New with iOS 10, however, is an Announce Call feature in which Siri will state the name of a caller (if known) when your phone rings. You can customize the feature in the phone’s settings, choosing whether to have Siri announce calls all the time, only when you’re wearing headphones, or only when you’re wearing headphones or in the car. If you prefer for your phone to remain mum, that’s an option, too. In the meantime, calls from VoIP providers are now integrated into the Phone app. Through visual voicemail you could always see who was calling you and play back your voicemail messages in any order. Now you can read a transcript of those messages, although the feature is still in beta as reflected by transcripts that can be far off base. The QuickType feature on iPhone keyboards already takes a stab at predicting the three words you might want to type next. With iOS10, however, if you’re texting with someone who speaks another language, you don’t have to manually switch keyboards to have the iPhone predict the next appropriate word in that other language. You can go back and forth and type in which language makes sense at the moment. Initially, the feature works with English, French, German, Italian, Portuguese and Spanish. Chinese is also supported. The moment you pull the phone out of your pocket or lift it off the table, the display comes alive. If you consider this a distraction, you can disable the feature. Tap the new icon at the bottom left corner of your inbox and you can filter mail by the messages you haven’t read yet. You may not go to sleep and wake up at the same time every day. But the goal of the Bedtime feature (inside the Clock) app on the iPhone is to get you to try. You can set up bedtime reminders, wake up sounds and populate sleep data into a third-party sleep tracker and the Apple Health app. Choose this Apple Music setting to optimize the space on your phone. You can select a minimum amount of storage for music, depending on your phone’s capacity, from 16GB (about 3200 songs) to 128GB (25,600 songs). In the past you were able to highlight a word in the Notes, Mail, or Messages and choose a “Define” option. You can still get a dictionary definition for that word. But “Define” has been renamed “Look Up” to better reflect that it can do more — including finding related movies, TV shows, Web videos, locations and Wikipedia entries. Your iPhone can help you remember where you parked your vehicle. Assuming you were using Bluetooth in the car when you parked, Apple will record the location and plot it on a map. I’d like to see a bit more precision in how it works, however. For example, in a “Today view” notification screen I was told that my car was parked 100 feet away from Churchill Road, when in fact I was parked on Churchill Road. A flashlight is one of those handy utilities that has been readily accessible in the Control Center that slides up from the bottom of the screen. Nothing new there. What is new is that on iPhones that take advantage of the pressure-sensitive 3D Touch feature, you can now change the intensity of the light from bright to medium to low.